Summer Student Programming that starts June 25th. A letter was sent home last Thursday with your students timetable to provide home with more information. 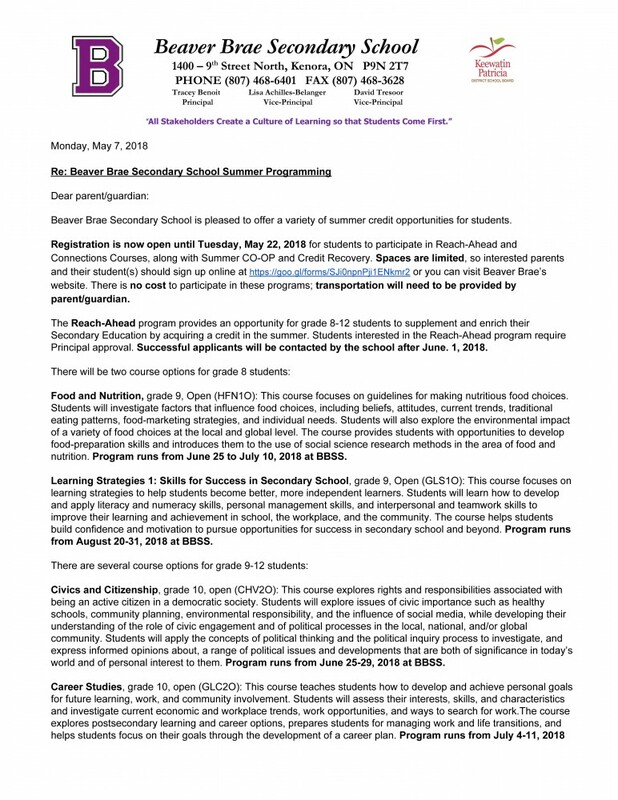 If you did not review the letter, please visit our website at http://beaverbrae.kpdsb.on.ca/ and select “Student Services” and “Summer Programming” for more information. Please note the dates have changed for any student participating in Career Studies or GLC2O course and the new dates are July 3-9. Sorry for any inconvenience this error has caused. Remember students must attend every day of the program in order to earn the credit. Transportation must be provided by the parent/guardian in order for the student to participate and some programs require the student keep their Chromebook until their course is completed. Any student participating in summer coop, must have their work education agreement signed and submitted to Chris MacNaughton on or before June 25 to start their placement in the program, otherwise they risk not being enrolled in the program. Summer co-op students are to complete their Work Education Agreement, requiring their employer, parent/guardian and student signatures and hand in to Student Services (before June 25th) or Manidoo (after June 25th). This paperwork is required to activate your placement. Any questions, please contact Chris MacNaughton at chris.macnaughton@kpdsb.on.ca or 468-6401 ext. 3551. 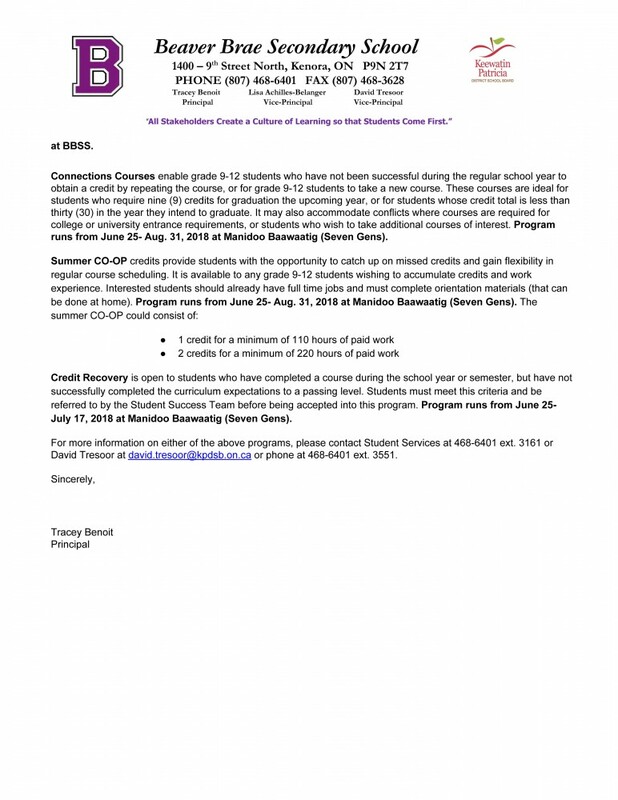 Registration (open until Tues. May 22) for summer programming is up and running for students to participate in Reach-Ahead and Connection Courses, along with Summer Co-op ad Credit Recovery. Students will be contacted shortly after June 1 if their application was approved.